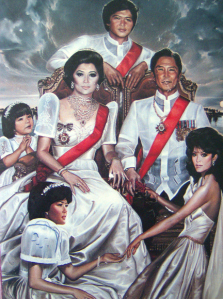 True, Bongbong Marcos cannot be made to account for his father’s sins. He is just the son. He was a kid when his father imposed a corrupt and brutal dictatorship over the country. It is not his fault to be the son of Ferdinand and Imelda and to have grown up so used to the trappings of absolute power and shielded from the realities of ordinary Filipino lives. Agreeing to and taking part in his father’s corruption, human rights atrocities and other abuses when his family was in power. His continuing cover-up of his family’s ill-gotten wealth and complicity in various schemes to rob the Filipino people. His continued enjoyment of such wealth and its use to keep his family in power. His continued denial, despite facts, historical accounts and official documents, of the atrocities of his parent’s conjugal dictatorship. ~ by targrod on October 23, 2015.